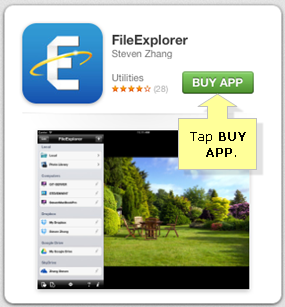 File Explorer is a file sharing application that allows you to access files from a remote Mac® or Windows computer and Network Access Storage (NAS) servers in your network as well as from cloud services such as Dropbox on your iOS device. With this application, you can view or stream digital media files such as movies, music files and image files from your network’s media server or from your Cloud service account right on your iPhone®, iPod® touch or iPad®. NOTE: You can view the images in a slide show. 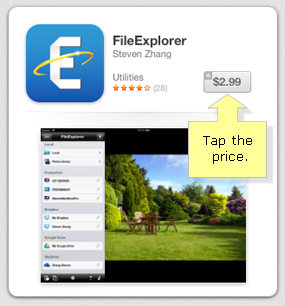 Search for the File Explorer app and tap the price of the application. The File Explorer application will begin to download and install. Once you have downloaded the File Explorer application, you can now enjoy streaming your favorite movies and videos, music, or view your images from your computer or NAS server. To learn how to stream your favorite digital media content from your computer or Network Attached Storage, click on the link below.